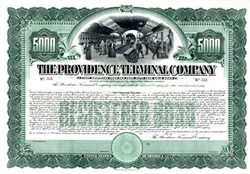 Beautifully engraved unissued $5000 Gold Bond Certificate from the Providence Terminal Company dated 1906. This historic document was printed by the American Banknote Company and has an ornate border around it with a image of active railroad termnial. This item is over 106 years old. This is the first time we have had this certificate for sale. Legislative Enactments.� (See N. Y., N. H. & H. R.R, charters.) Merger. � Merged with the New York, New Haven & Hartford Railroad Company Dec. 29, 1906. Property owned at date of merger. � Providence Terminal. Constituent Companies. � New York, Providence & Boston and Old Colony Railroad Terminal Company.